This morning in the village of Har Adar, near the Jerusalem-Tel Aviv highway, a terrorist shot four border guards, killing three. The fourth, Amit Steinhart, 33, is now awake and in stable condition, following surgery at the Shock Trauma Unit in the Swartz Center for Emergency Medicine at Hadassah Ein Kerem. According to Dr. Alon Pikarsky, chief of surgery, bullets to the stomach and chest cavity were removed. Steinhardt — the security officer for the town, and a married father of one — is recovering at the Sarah Wetsman Davidson Tower, and has already spoken with his family. We wish him a speedy recovery. Our prayers are with the families of the other terror victims. Some hundred workers with permits enter the town each morning to work in Har Adar, a Jewish village of around 4,000 residents. The terrorist was among them, with a valid permit to work. He cleans houses of residents, including the home of famous Israeli weatherwoman Sharon Wexler, the daughter of Hadassah retired plastic surgeon Menachem Ron Wexler. Many of the workers are long-time employees in the village and are familiar faces to those who stand at the checkpoint. The terrorist’s behavior and clothing caught the attention of the border guard and neighborhood guard. He pulled out a gun and shot four of them at close range. Three were killed immediately. The Hadassah staff received advanced notice of the patient arriving and within minutes filled the Shock Trauma Unit with doctors and nurses in every field. The patient was taken for immediate surgery in the Sarah Wetsman Davidson Hospital Tower underground operating rooms. 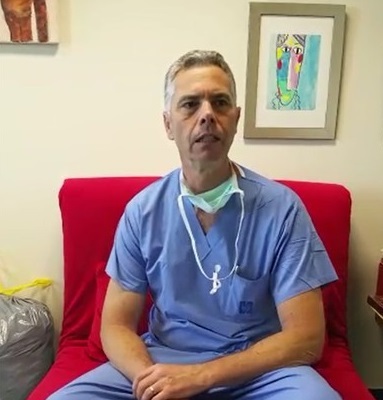 According to Professor Alon Pikarsky, chief of surgery, who headed the team which included the orthopedic trauma team, the bullets to the stomach and chest cavity were removed from the shoulder where they were lodged. Prof. Pikarsky is cautiously optimistic. The dead have been identified as Solomon Gavriyah, 20, a border police officer from Beer Yaakov; Youssef Ottman, 25, a civilian guard from the nearby Arab Israeli community of Abu Ghosh, and Or Arish, a civilian guard from Har Adar. May their memories be for a blessing. The terrorist, Nimer Mahmoud Ahmad Jamal, comes from the nearby village of Beit Surik, (also about 4,000 residents). He’s a father of four, with a record of domestic violence. Reportedly, his wife ran away recently to Jordan because of abuse. The village of Har Adar has beautiful red-roofed homes and is considered a quiet and affluent suburb of Jerusalem, near Mivasseret Zion.